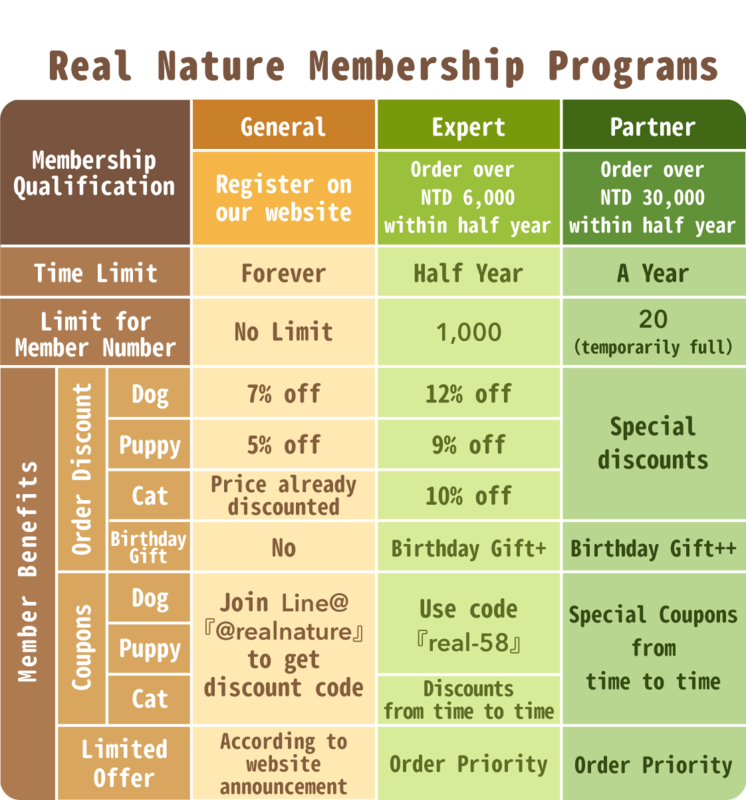 Membership Programs - Real Nature Holistic Pet Food - RealPower Nutrition Co., LTD.
Real Nature Holistic Pet Food launched in 2014, and until now we have gained some achievements. These are all from the recommends of friends, and the word of mouth between social media groups. Please send a message via Facebook or Line@, tell us that you are qualified. We will check your last 6 months orders before the application day, and apply for you as soon as possible after we confirm. Application time is about 30 minutes (high priority), or 3-5 days. *Since the limited membership quantities, the order over 6 months cannot be included. For now, the partner membership is full, and there is no any partner membership is about to expire. Therefore, the application for partner membership is closed temporarily, and we do not accept any reservation for it. ＊Because of the cost factor, part of the products is not applicable for coupon, or has different discount depends on different membership. Thanks for your consideration for any inconvenience caused.